Kale is a member of the cruciferous family of vegetables which includes cabbage and its many relatives (bok choy, kale, brussels sprouts, broccoli, cauliflower, collard greens). Kale’s broad, open leaves resemble those of ancient varieties of wild cabbage, which also did not form heads. Because of this similarity, kale is often considered one of the oldest, early members of the cabbage family. Kale originated in Asia Minor (Turkey) and spread to the southern Mediterranean region in 600 B.C.E. It was enjoyed by the ancient Romans and used as a peasant crop until the end of the European Middle Ages when headed cabbages were bred. In the 1600s, kale was introduced to the United States, where it is popular today, especially along the east coast. Kale is a cool-season crop because of its resistance to frost. In fact, it is commonly acknowledged that kale's flavor improves after the first frost. There are many different varieties of kale. Certain varieties are grown ornamentally. Edible varieties come in a range of colors from dark blue-green to red and have sturdy leaves, and leaves are usually sold tied together. Curly kale is deep green and has ruffled edges; it is more heat-tolerant than other varieties and withstands cooking well. Tuscan kale (also known as dinosaur kale, black cabbage, lacinato kale, or cavolo nero) has dark green leaves that look like palm fronds and are highly textured like dinosaur skin. Kale is often used interchangeably with and confused with collards. Although both share the same botanical name and are in the group acephala (which means “without a head” in Latin), kale is darker green in color, with crinkled texture, thicker and chewier, and with a stronger flavor. Common ways of cooking kale include steaming or sautéing in olive oil and garlic. It is a great addition to soups or pizzas and can also be topped with toasted pine nuts to make a simple side dish. Another way to enjoy kale is by baking or dehydrating them into “kale chips”, which develop a crispy, melt-in-your-mouth texture. Kale is most often enjoyed cooked, but can also be placed raw into fresh salads or vegetable juices. 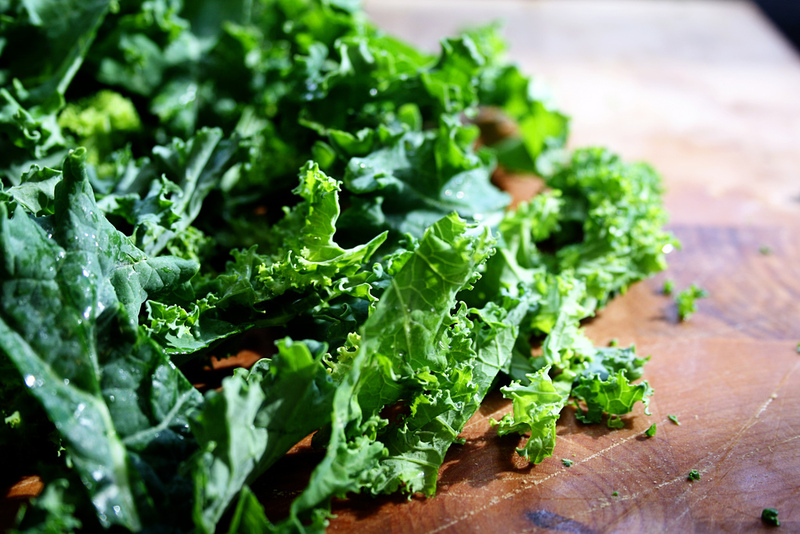 Fresh kale is best stored in the refrigerator, either dry in an open, plastic bag or wrapped in a paper towel. While it can be stored for up to a week, kale becomes increasingly bitter the longer it is kept and is best consumed soon after buying. Kale can also be stored frozen after blanching. Kale is a rich source of glucosinolates that imparts a spicy, bitter flavor, and are pre-cursors to cancer-fighting compounds. Cutting, crushing and chewing the vegetable releases these glucosinolates and activates their cancer fighting properties. But this activity degrades with exposure to air and at room temperature so kale is best consumed promptly after preparing. Methods of preparation can also affect the concentrations of glucosinolates. Boiling kale leaches out bioactive molecules because glucosinolates are water-soluble. In contrast, steaming allows more glucosinolates to remain, because it reduces kale’s contact with water. Stir-frying allows the vegetable to maintain most of its glucosinolates. It has been conjectured that kale's “open-leaf” structure allowing exposure to sunlight, is the reason why kale contains higher levels of nutrients and and antiangiogenic carotenoids compared to tight-headed cabbages. Kale, a member of the "cruciferous vegetables", is a rich source of glucosinolates that serve as the plant's natural defense system. Cutting and crushing the vegetable releases these glucosinolates which impart a tasty bitterness and also helps activate their cancer fighting properties; therefore, chewing kale is part of practicing good health. But this activity degrades with exposure to air and room temperature so kale is best consumed promptly after preparing. Kale and collard greens have among the highest concentration of lutein and zeaxanthin carotenoids in carotenoid-rich green leafy vegetables, and are associated with risk reduction for certain angiogenesis-related forms of blinding diseases such as age-related macular degeneration (AMD). Kale has four times the vitamin C as an equal weight of oranges or limes. Kale tastes sweeter after a frost because to protect the leaves from freezing, the plant tissue converts stored starch into soluble sugars, which lowers the freezing temperature. During cooking, kale shrinks less than other greens, by only a half or quarter.